Unemployed women at what they called the Bronx "slave market," waiting to be hired as day workers. 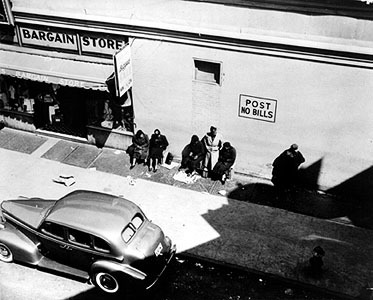 African American women who stood on these street corners looking for work were among the city's most exploited workers, earning ten to fifty cents an hour in the 1930s. From the Schomburg Center for Research in Black Culture, NYPL. See this image in the Ordinary People, Extraordinary Lives exhibit.